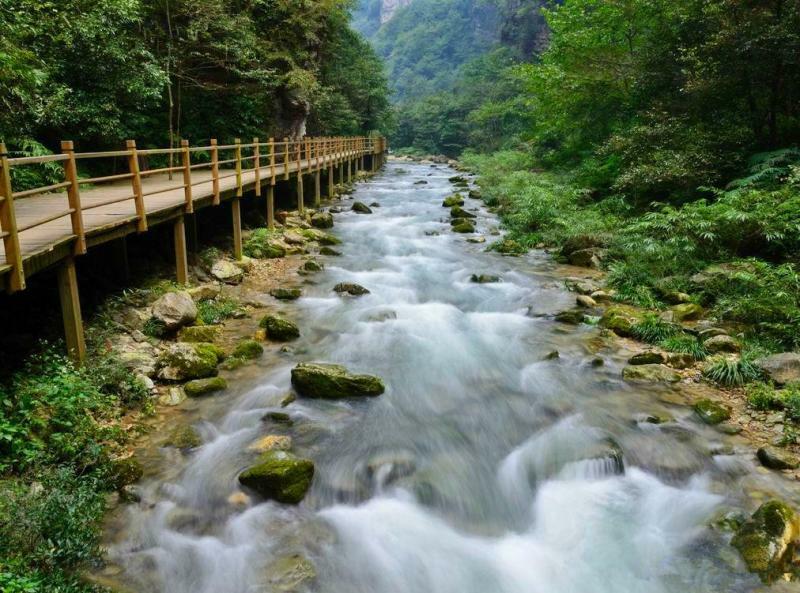 Located in Cili county of Zhangjiajie city in middle China’s Hunan Province, Zhangjiajie Grand Canyon is in close vicinity to the World Natural Heritage, World Geo Park wulingyuan scenic area. 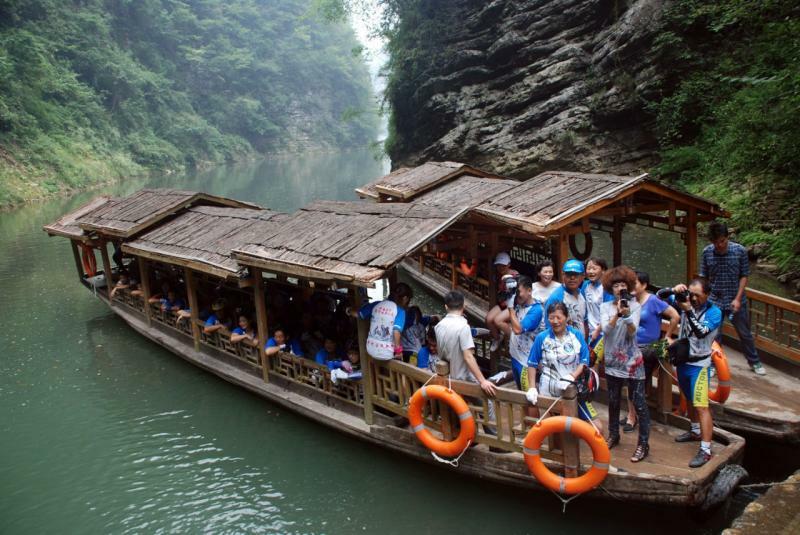 Legend has that there were a number of rotten ship planks flowing out of the spring, but no one knew where they had been come from, thus it was originally named Luanchuan (rotten ship planks) Canyon. 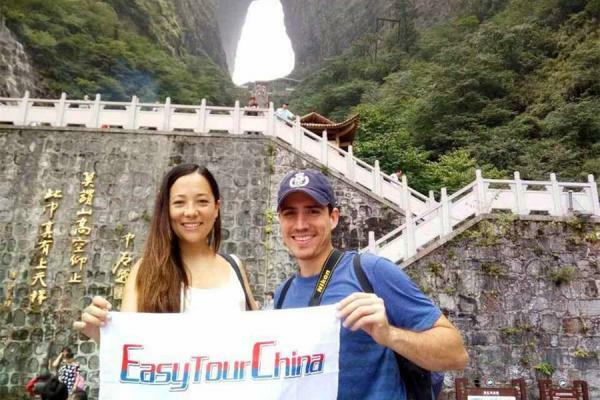 It was also called Luanquan (multitudinous springs) Canyon, as it is dotted with masses of springs, streams and waterfalls on the mountain cliffs of the canyon. Zhangjiajie Grand Canyon is much favored by explorers and lovers of great outdoor from home and abroad, by featuring typical Zhangjiajie landform, breathtaking cliffs, lush forests, ancient caves, colorful ponds, and a river running through the canyon. 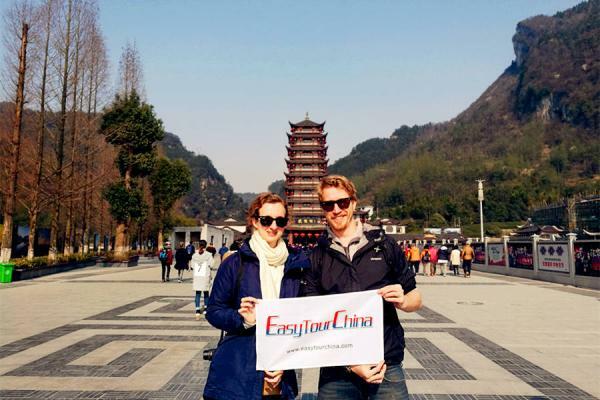 What’s more, visitors can expect all sorts of sceneries of the north temperate zone here. Therefore the canyon is ideal for exciting adventures by hiking, boating, challenging the strop sliding, and walking on the world’s highest, longest glass bridge. 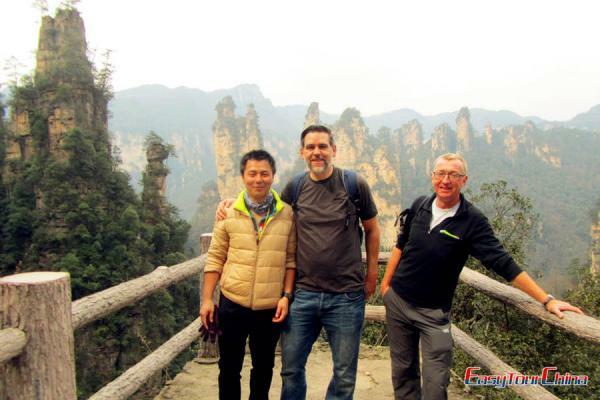 The Zhangjiajie Grand Canyon hiking takes 3 - 4 hours, and begins with a long and narrow vertical gap between two mountain cliffs known as a gleam of the sky (一线天), with the sun light shining through the gap. 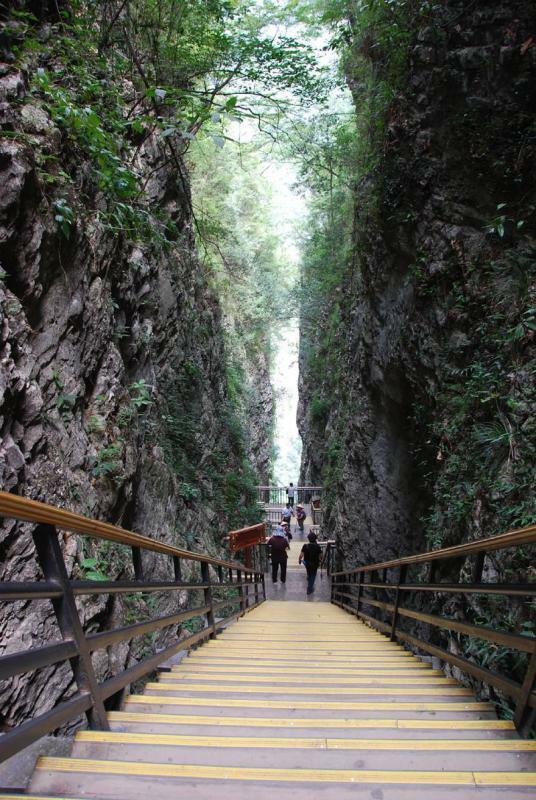 A 700-meter-long trail of steep stairs lined with the iron railings leads down the Canyon. The elevation difference between the gap on the top and the canyon on the bottom is over 300 meters. As you descend, some stairs are so steep that they look nearly vertical. However, you will find it is most rewarding when passing through the beautiful, tranquil sceneries, despite the wobbly legs. Halfway down, there is a 600-meter-long marble slide, winding its way down to the bottom of the valley (it is optional, you can also choose to hike down). Visitors are given a thick canvas to tie around the waist and a pair of gloves to protect the hands (cost 20 RMB in total). 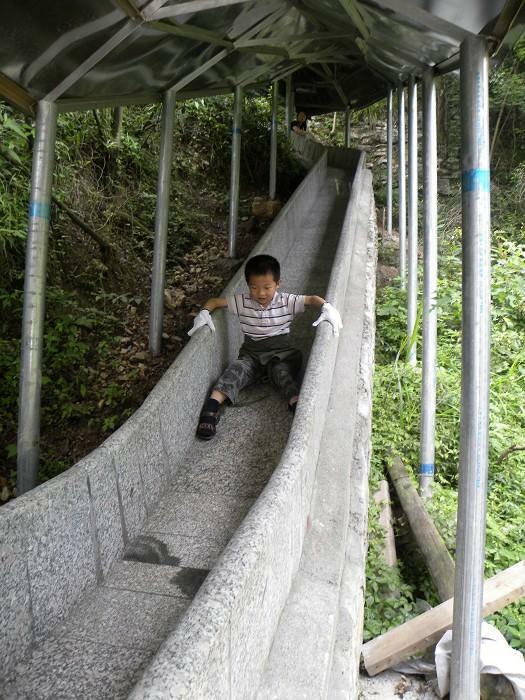 You will learn how to control the speed of sliding down and have a lot of fun. After another one hour walking, you will be taken by a boat down a river towards the exit. Just enjoy the relaxed time on boat! 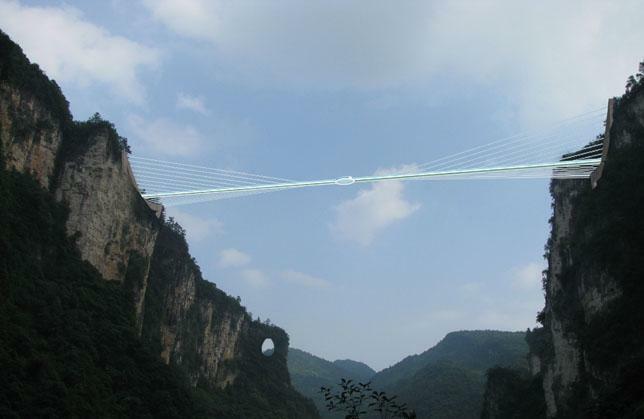 It is known as the world’s highest, longest glass bridge connecting Lishuya and Wuwang slopes, being 430meters long and 300 meters high above the valley floor. The thrilling bridge is an architecture wonder designed by Haim Dotan and made up of transparent glass with a bungee jump platform at the bridge center, where you can try the highest bungee jumping in the world, while at the same time having a panoramic view of the majestic Zhangjiajie Grand Canyon. 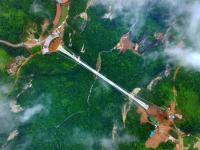 The strop sliding links the Glass Bridge and Yilianyoumeng scenic spot (一帘幽梦景区), 190 meters long. With four unidirectional tracks, this strop sliding project works according to the weight power traction technology on the basis of two cable-stayed wire ropes. 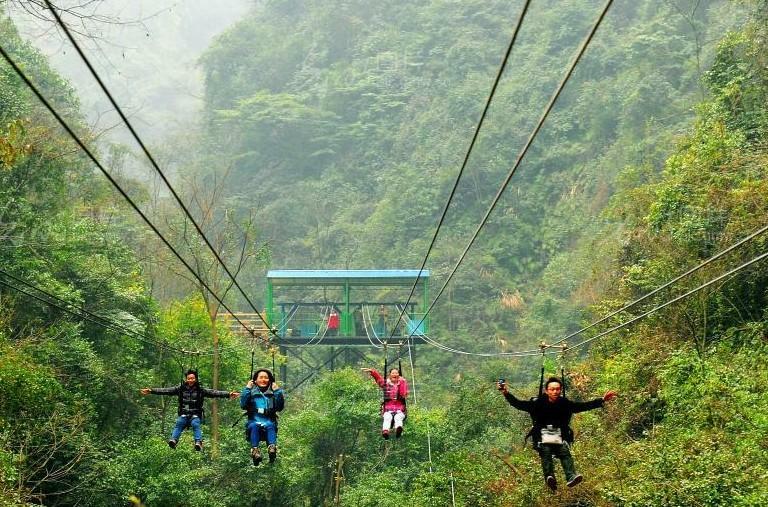 Visitors use their own weight to swing from one mountain to another quickly by sitting on a chair with a safety jacket. The program belongs to the low carbon project, without using any power or energy. The strop sliding is breathtaking and exciting, which does not only shorten the distance to go downhill, but also offer a chance to admire the Laroukeng and Yanzi Cave scenic spots of the grand canyon from the air.